Experience level. Intermediate. Wall dive with moderate current. 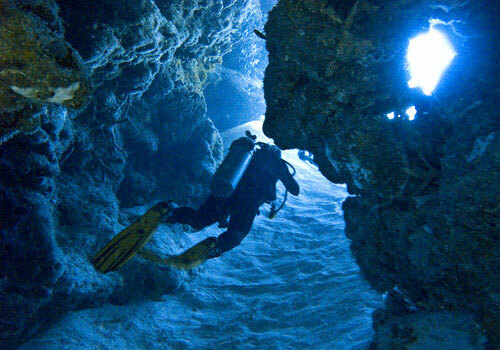 Santa Rosa is one of Cozumel's signature Cozumel Dive Trips. It is a nice wall with quite a few nice swim through. 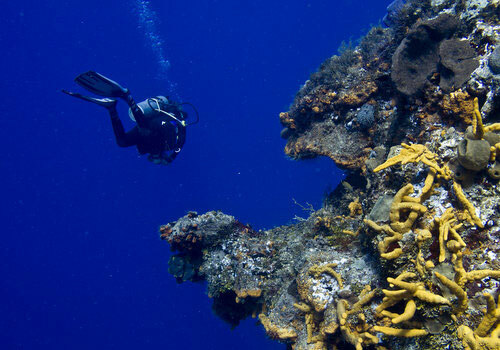 It is not too far from San Miguel so it is easy for the dive boats to get to it. It does get a lot of diver traffic, so try to plan your dive accordingly. It makes a nice afternoon Cozumel Dive Trips, when most of the divers have gone elsewhere. On the top edge of the wall towards shore are sandy bottom areas and with nice big overhangs to hide out from the current. The coral is rocky with large rocky outcrops that are 30-40' tall. The wall drops steeply, but there are ledges and some sandy areas on the way down. There are beautiful swim through that take you from the wall back to the sandy area, and vice versa. Look for French Grunts and Schoolmasters in the darker areas. You can go deep on this wall, well over 100', and check out some areas that don't get many divers. The wall is steep and rugged, you feel like you are flying along a cliff. Be sure to look up under the huge overhangs for the giant Dr. Seuss like sponges. There are not as many fish here as there used to be, which may be due to the high traffic. However, there are still a lot of things to be seen. 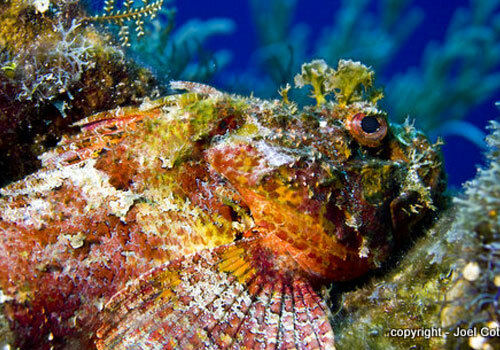 Be on the lookout for Scrawled Filefish, Turtles, Groupers, giant Parrotfish, French and Queen Angelfish, and quite a few Toadfish. There is a good chance of spotting a giant Green Moray eel. Just need a Cozumel Reef Guide. Buy it! Another option is to do Santa Rosa as a second dive and glide along the top of the wall. It is not done very often and you will see a lot of fish there. 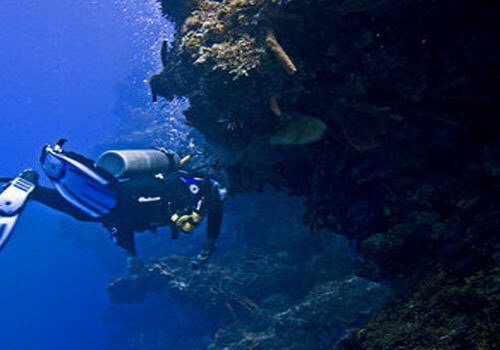 For proper diving techniques, check out Cozumel Reef Conservation.